After living in France and seeing how my friends would take a month off every summer I’ve always wanted to do the same and take an extended summer vacation. Like for 3-4 weeks. But usually by the time I realize I should plan something I look up accommodations and airline tickets and prices are sky-high and everything is booked. That happened to me two years in a row so last year I decided to book my summer vacation in December. I like to plan things a few months in advance so the idea of planning 6-9 months out was a bummer but as a result we were able to plan a really cool trip on a budget. First we had to figure out where to go. I had noticed the cheap direct flights on Norwegian Air to Scandinavia and thought that might be an option. (They have direct flights from Oakland from $300-$600!) We also considered the Mediterranean, Hawaii, and Costa Rica. I did a bunch of research but didn’t buy anything. I also wanted to figure out the best way to save on our housing since a hotel can get expensive for a month. My friend does home swaps all the time so she explained the whole process to me and I decided to sign up for a website(I had to pay for a membership.) Almost immediately I got all these offers of possible house swaps. From everywhere to France, Spain, Italy and Mexico, and remote places I hadn’t even heard of. We also got an invitation to a beautiful modern house in Norway in the middle of the fjords. I fell in love with the house and when I double checked the airfare I realized the tickets were $500 roundtrip. That made our decision for us. In the end we were able to cover everything for our family of four for $2000. Of course there are more expenses for traveling but the main expenses of flights and lodging we were able to get a good deal on. We are planning on taking a real vacation for 7-10 days in a different part of Europe and then the rest of the time we will be working remotely and keep business hours at the home in Norway. When you are in Europe but still working US work hours it is actually a really nice schedule. You wake up and spend the day doing whatever you want (sight-seeing, hiking, etc) then, about 4pm everyone in the US comes online. So you work from 4pm-12pm to be available for emails etc., then go to sleep. It’s a pretty great schedule for hanging out with family. Friends ask if we feel weird having people staying in our home. The nice thing is we’ve exchanged a lot of emails with the family and have even been following each other on Instagram so you get to know people a little before you actually swap homes. Also, we have friends and neighbors that can check in while we are gone so it doesn’t feel so anonymous. Would you ever do a house swap? I’d love to hear about your experience if you’ve done it before. Also, we are in the throes of vacation planning. 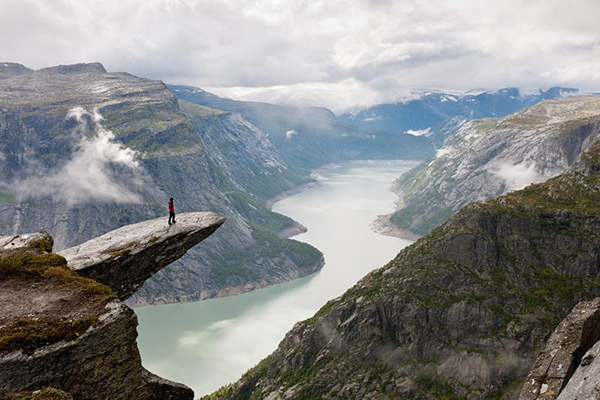 Do you have any must-sees or must-do’s in Norway? We are going to be staying in the north in Alesund but plan on renting a car and getting around the country a bit including doing some hiking and camping. i have heard such amazing things about the norwegian fjords! that trip is at the top of my travel to do list. i am such it is going to be an incredible experience. I have wanted to do this for so long but I’m just not sure yet. How will you prepare your house for the swappers? Are you packing anything away? Good question! Our house is pretty kid friendly already. I’m definitely not worried about anything being stolen. I will probably pack away family photos and personal things that make the house feel like “our home” just to make it feel like a clean slate and more comfortable for our guests. These pictures are so gorgeous! France is definitely on my bucket list for sure! What a great deal for a trip abroad! this is so cool!! my husband and i were just talking about doing something like this for the winter… calling it a “work-cation!” i recognize that second photo because my father in law was just showing us a hike route that will take him there in july. apparently it’s a long but really nice hike. i would be too afraid to walk out onto that piece of rock though 😛 have so much fun on your trip!!!! Very cool! I’ve never done that before but looking forward to hearing your experience and, after doing it, if you would do it again! What about if our house isn’t as cool like yours? Our house is great but the location is not exactly vacation worthy. And Airbnb is costly for that length of time. Also, is your membership a yearly fee or a one time sum? How lovely! You also have the fact that in July it is light almost all night, so it feels like day (you will not see the midnight sun in Ålesund, but still) I hope your family will enjoy Norway, and if you need a place to stay near Oslo, you are very welcome to borrow our guest room! I just did the OAK-Oslo flight on Norwegian with my two kids by myself! You will love it. The planes are new and fancy. Just pack a lot of water. They charge you for everything. If you’re going to Oslo a trip to Tim Wendelboe is a must if you’re into coffee. Visiting the King’s farm is also fun with kids. Otherwise make sure you eat plenty of kanelboller and brown cheese! ^Sara. When you booked did u get seat assignments? Thinking of using Norwegian for Stockholm trip w. 2 kiddies <6. Would prefer to sit with them. thx. No i didn’t. I figured if they weren’t going to sit me with my toddler i would ask to switch when i got on the plane (or leave her sitting alone and someone else would have to deal with her. Haha) But when i checked in we were sitted together. No problem. Congrats! We have not done a house swap, but we rented out our apartment in Boston through airbnb.com while we traveled and during our summer in Paris. It was incredibly lucrative, offered us the opportunity to meet other travels and enabled us to explore the world for less money. Only once did we have something stolen. It was our first guest, but since what they took cost $20 at Target and we made $2,000 off their visit we were not worried. It never happened again. People are genuinely good and I would not worry at all about stuff being taken. We are currently renting a place we found on airbnb.com for one year in Costa Rica and our plan is to do the same in Ecuador come September. We work online so it does not matter where we live. I love that people are trusting and sharing in the name of travel. Have a fantastic time. I cannot wait to follow your journey. Absolutely amazing! I am always enthralled by those who are able to work solely online and live anywhere! What do you guys do for work? So you seem to be a pro at finding good deals on airfare. Any chance you might do a post at some point on pointers? Where you search? How you search? I’m trying to do a travel-type post every Tuesday so I definitely will. The secret is to just spend time looking. I probably spend an hour every week looking. Yes! I’ll definitely do a post on this! This would be so awesome! But I guarantee you my home in the middle of nowhere in rural idaho is not a destination of choice. Ha! I’d totally stay in rural Idaho!! Great idea to house swap for family vacations. It definitely makes so much more sense having a full house with kids then doing the hotel rooms. I did an internship in Stavanger during my last year in college over the summer months and absolutely fell in love with Norway and the Norwegians. Some of the sweetest people you will ever meet. Enjoy the trip! House swapping is the best! We are members of the same house exchange network, and it’s been such a great way to cut down on vacation costs, as well as explore new places. When we get a house swapping request, we always spend a few weeks exchanging emails and phone calls in order to get to know one another better–we don’t remove items from our home or lock things up, because by the time the exchange rolls around, we feel very comfortable with our exchange family. That said, this is the first and only summer we’ve had trouble finding a house swap–for San Francisco of all places! Know anyone in San Francisco who is interested in visiting Portland, OR, this summer? We’ve been trying to find a swap for months and we’ve come up short for the first time ever! I spent some time in visiting Norway last summer and absolutely fell in love! We spent a few days in Oslo (highlights: Vigeland Sculpture Garden, the Folk Museum) then took “the Most Beautiful Train Ride” from Oslo to Myrdal and then down on the “Flamsbana” (would be great with kids!). 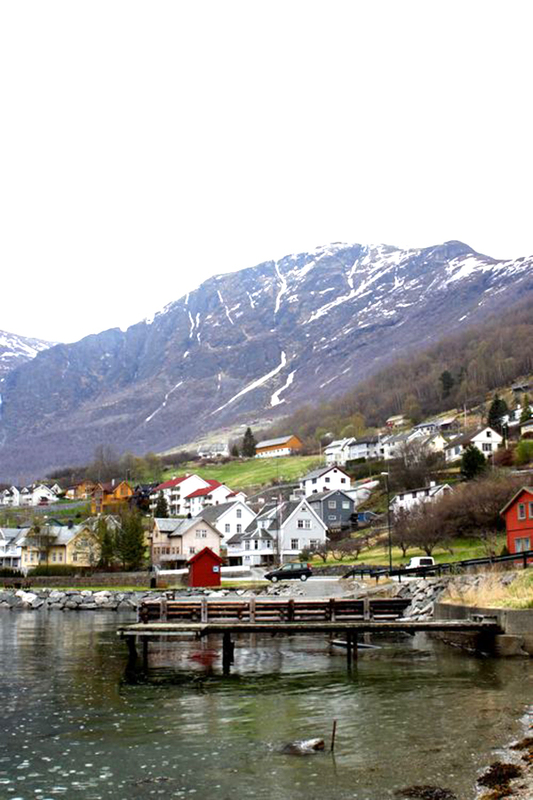 From there we took a boat to Balestrand, which might be the most picturesque place I have ever been! It is drop.dead.gorgeous. There isn’t much to do but it was fun to spend a few days taking boat trips, resting along the fjord and eating at the Kviknes Hotel’s famous smorgasbord. We ended the trip in Bergen which is also beautiful. There is a restaurant called “Enhjorningen” that is the oldest fish restaurant in Bergen. It’s this funky old school space and the food was absolutely delicious! The best thing about being in Norway in the summer is being outside until late into the night! One night we had a gathering with some family and I had to look twice at my watch when I realized it was midnight and we were still all up and about playing lawn game (including small children!). It was a treat. Yay Norway! I just moved back to the States after 1.5 years in Norway. Your mind will be blown by the beauty of the fjords, and I am not exaggerating. Now, I’m sure you’ve done your research, but driving around Norway is a rather lenghty (and expensive!) process. If you can by any means rent an electric car, do it. The electric cars receive all sorts of benefits when it comes to parking, ferries, highway driving, etc (we’re talking FREE!). I’m not sure what it costs to rent an electric vehicle (or if it’s even possible), but it’s probably worth looking into. Since you’ll be between Trondheim & Bergen, I HIGHLY suggest visiting both cities. In my opinion, Trondheim is the most beautiful city in all of Norway (Nidarosdomen – Nidaros Cathedral, River Nidelva, Old Town (including the beautiful Old Town Bridge! ), and so much more). But Bergen is also a beauty (especially when it’s not raining! ), with such treats as Bryggen (a world heritage site), the seven mountains surrounding the city (you can ride the Fløybanen to the top of Mt. Fløyen), and more than I can list here. But in the midst of the city possibilities (I’m certain Ålesund is on your list, since you’ll be so close), be sure to just stop in at the little fjord & mountain towns. Since the sun will be shining (no stop), everyone will be so happy & friendly. Eat your weight in Norwegian waffles (vaffler) topped with strawberry jam & sour cream, drink tons of black coffee, divulge in all the Fria chocolate you can get your hands on, and know that it’s perfectly safe (and a delicious idea) to eat the hot dogs from the gas stations. If you’re visiting the big cities, you’ll likely find yourself among many other tourists, so if you’re looking to befriend Norwegians, stick with the small towns… But just know it might be a bit of work (on your part) to get them to open up; once you do though… they’re beautiful & loyal people, and you’ll find yourself with friends for life. Also. Please go hiking. As much as possible. And if you manage to befriend a Norwegian, have them teach you their jedi ways of packing for hikes (be sure to always pack oranges & kvikk lunsj [the Norwegian equivalent to Kit Kats]). The viking blood still runs strong in the people there. I would do an exchange in a heartbeat, but my husband would never go for it as he is so intriverted and feels like it would be an invasion on our privacy. I follow this blog and they just got back from Norway. Here is the link. Very cool. I’m an american expat living in Oslo. If you visit Oslo, make time for the folk museum, the viking ship museum, Vigelandpark, coffee at Tim Wendelboe, and any baked good from Åpent Bakery. Send me an email if you have any further questions about Oslo or Norway. Oh and be aware that store close early on Saturday afternoon and nothing is open on Sunday. I second the advice of checking into an electric car. Gas is super expensive. Actually everything was super expensive. Buying a bottle at of water at a gas stattion was $5 (luxury tax). Eating out was very expensive too (for us, we never found great food) so since you have a home, making meals might be more fun. Oh, and we are just rent a car and explore kind of people, too. So be warned that due to the geography, there are a lot of tunnels and ferries involved. Not a problem, but something we would have been better off knowing beforehand. What a cool idea! Very inspiring. I look forward to following along with you and Paul. We live in Dublin but go back to Maine every summer for 6-8 weeks, so we’ve rented our apartment to strangers each time. WE’ve had such great experiences with it! The two things I always suggest to people – get a cleaner in to clean before you arrive back home. So important! And the second is to move or store anything that you’d be devastated if it broke or was misplaced. Those two things have made all the difference! We have rented out our home for the past three summers. We spend some time traveling and some time living/working remotely. It has been the best experience. We have met really interesting people and even though a direct simultaneous houseswap hasn’t worked out,we have been able to work around it and find options for visiting family and friends while seeing the world. If you have any questions about preparing your home, ping me. We have it down pretty well now. Have the best time in Europe, Norway is one of our favorites! We swapped apartments a few summers ago with two couples – an older couple from berlin, and a young couple from paris. The older couple were veterans of swapping, and it showed in the instructions they left. Little things you don’t think about, like how to run the washing machine when it’s in a different language, they included on the instruction sheet. And once we saw that we realized we should’ve done exactly that. We had left a list of our favorite places to eat and see, and that’s helpful, but we realized we didn’t specifically say things like, don’t put the chef’s knives in the dishwasher , or this is how you use our dryer. Thankfully there weren’t any problems, but we did find that the lint trap in the dryer was never emptied. The little things we take for granted that we know that if you don’t own one of those appliances you wouldn’t know. All that said, we had a great time, our apartment was fine when we came home, and I would swap again in a heartbeat. It’s a great way to see a city. And SO much cheaper. Plus they took care of our cat. Oh you guys are so lucky. For us here in Australia to fly anywhere costs around $1,500 (each!) so for a family of five it becomes a once in a lifetime thing. My one greatest wish is to spend one to two years living in the U.K. or Europe so we can see as much as possible while living there. I love the idea of house swaps and we are considering doing one with friends. They live in Melbourne, Australia and we live in a rural hinterland village in Queensland. Swap city living for country living. However, I think it’s maybe worse with friends coming into your home than strangers. I am going back to Norway for my second visit in July. I loved Bergen and Trondheim. Norway is the most beautiful place I have ever been! Enjoy your trip, sounds amazing! Awesome! You can house swap with me anytime in Cape Town, South Africa, I’d love to go to San Fran. We went to Alesund for our honeymoon! such a sleepy little town, but so relaxing.